Your skin is your first line of defense from the outside world. It protects you from infections, chemical exposures, and harmful ultraviolet light. It also helps regulate the temperature inside your body by producing sweat. Sweat on your skin comes from sweat glands located all over your body (except in your fingers, toenails, and ear canals). These small glands are regulated by the brain and produce sweat that comes to the surface via ducts on your skin, which then evaporates and helps cool you down. Heat rash (prickly heat or miliaria) is a mild inflammation of clogged sweat ducts. 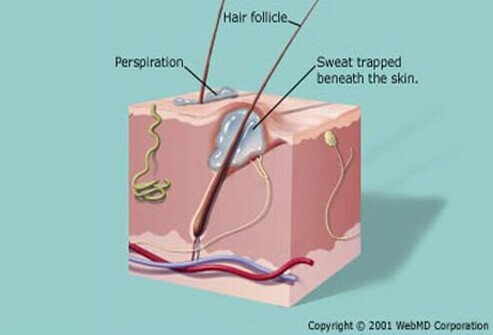 When the sweat ducts are blocked the sweat cannot come to the skin surface to evaporate and becomes trapped under the skin. The rash is characterized by small, raised bumps (like coarse sandpaper) spread evenly across small patches of skin. The rash usually goes away on it's own and resolves in hours to a few days. What Are the Symptoms of Heat Rash in Children and Adults? 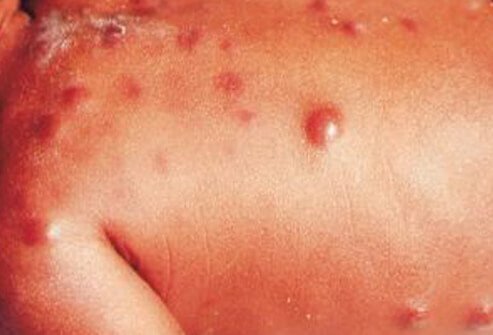 The common symptoms of heat rash include a fine, bumpy, itchy rash, skin burning, and a "prickly" feeling (like something is crawling on skin). The most common body parts affected are areas commonly exposed to the sun such as the hands, face, neck, and elbow folds. Heat rash may also affect areas covered by tight clothing such as the abdominal wall, groin, thigh creases, buttocks, and the area under the breasts. 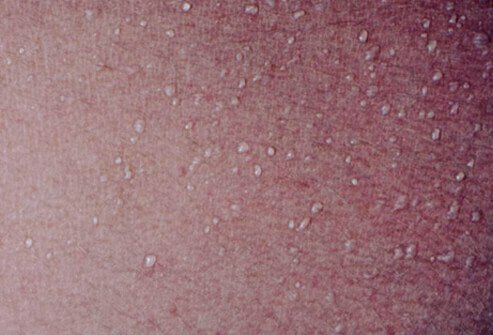 Miliaria crystallina, or clear heat rash, looks like small, clear beads of sweat on the top layer of skin. It is usually very mild and doesn't produce many uncomfortable symptoms. Red heat rash (miliaria rubra) is the most common form of heat rash. This type is also called "prickly heat" because of its intense itching and burning symptoms. The sweat glands are blocked and the inflammation causes a red color to the rash known as "rubra" (hence the name miliaria rubra). 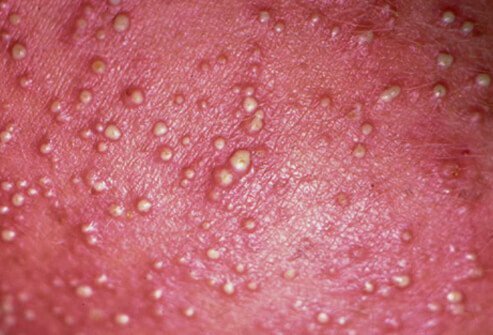 When pustules form on a case of red heat rash it is called white/yellow heat rash (miliaria pustulosa). These pustules may be the first signs of a skin infection and should be checked by your doctor. With repeated episodes of heat rash, sweat glands in larger areas of the skin may be chronically inflamed and cause damage to deeper layers of the skin. When this happens, large, firm bumps may appear especially after exercise or exposure to heat. This is called deep heat rash (miliaria profunda). 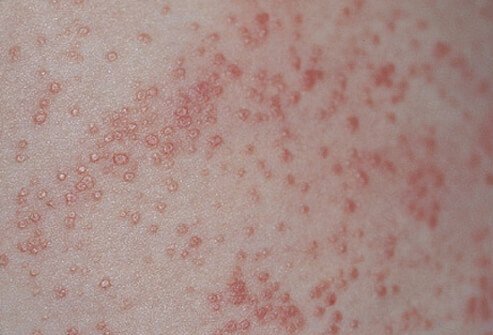 What Are the Causes of Heat Rash? Skin around the neck, armpit, or groin that touches or rubs adjacent skin prevents sweat evaporation. Tight clothing around the waist, abdomen, chest, or groin that prevents evaporation of sweat. Bundling up in heavy clothing where sweat can accumulate on the skin. Heavy creams, oily lotions, or adhesive bandages can clog sweat ducts. Who Is At Risk for Heat Rash? Why Are Babies So Prone to Heat Rash? Small children frequently get heat rash because their sweat glands are immature and they cannot get rid of the sweat they produce. This is common when children are overdressed, bundled up for cold weather, or have a fever. How Is Heat Rash Diagnosed? 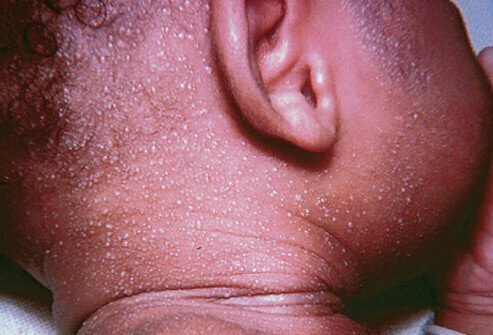 The diagnosis of heat rash is made by seeing the characteristic rash in certain common skin locations, especially after known heat exposure. 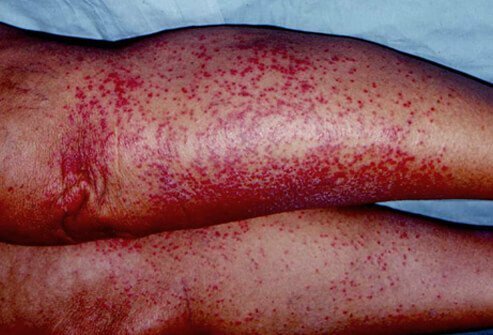 A doctor can usually make the diagnosis with a visual examination of the rash. However, complicated or atypical cases may need confirmation from skin culture, skin scrapings, or biopsy. Other skin conditions can mimic a heat rash including allergic reactions, bacterial infections, fungal infections, or eczema. Heat rash is usually self-limited, meaning it resolves on its own without treatment. Over-the-counter treatments such as calamine, hydrocortisone cream, itch preparations (such as Benadryl spray), or sunburn lotions can be used to treat the itching and burning symptoms.. Excessive use of heavy creams or lotions may make the heat rash worse. Occasionally the heat rash may get infected, especially if it has been scratched open. Bacteria can invade the skin and cause cellulitisinfections. Symptoms such as redness, swelling, increased pain, fever, or pustules should be checked by your doctor. Antibiotic treatment with topical creams or medications taken by mouth may be necessary to treat infections associated with heat rash. How Can Heat Rash Be Prevented? Keeping sweat glands from becoming clogged is the best way to prevent heat rash. 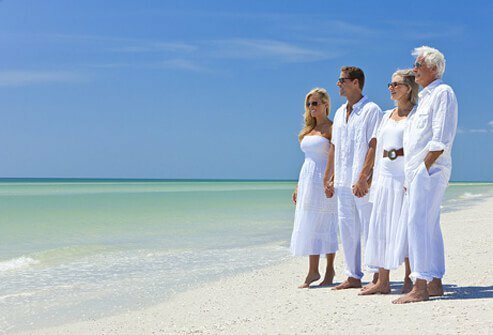 Wear loose-fitting and breathable clothing. 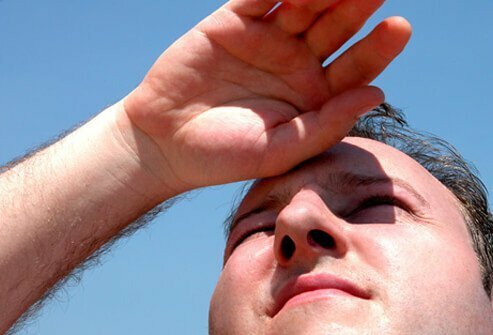 Avoid exercising in hot, humid weather. Keep skin dry, especially areas like skin folds or creases where sweat can accumulate. Stay in air conditioning whenever possible if you are prone to heat rash. 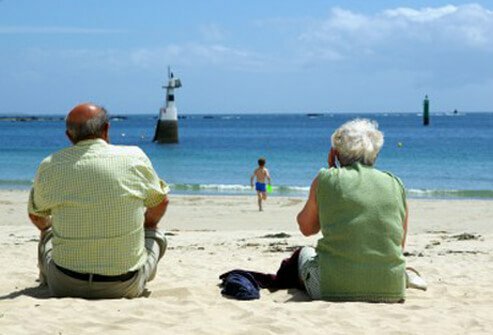 To an extent, your body can acclimate to hot and humid weather over time. 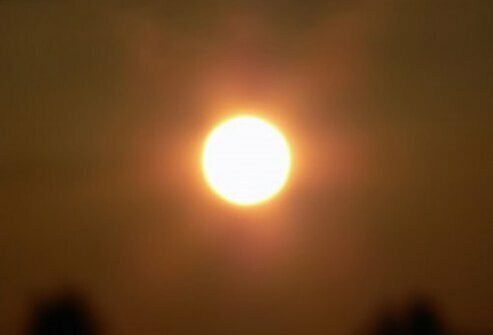 Try to avoid working or exercising during times of extreme heat. Take frequent cooling breaks, drink plenty of fluids, and stop activities if you feel over-heated, lightheaded, dizzy, or faint. Before exercise in hot and humid climates take into account the temperature and also the heat index. The heat index is a calculated measurement of the overall feeling of heat and humidity. Since sweat cannot evaporate if the water content in the air (humidity) is high, sweating alone cannot cool the body. How Much Water Should I Drink in Hot Weather? It is hard to tell if you are dehydrated and need to drink more water just by how much you sweat. If you are dehydrated, your kidneys will try to retain as much water in your body as possible. This results in decreased urine output and the urine you do eliminate may be dark or concentrated. In hot environments, a good rule of thumb is to drink enough liquids to make your urine appear clear or just slightly yellow. 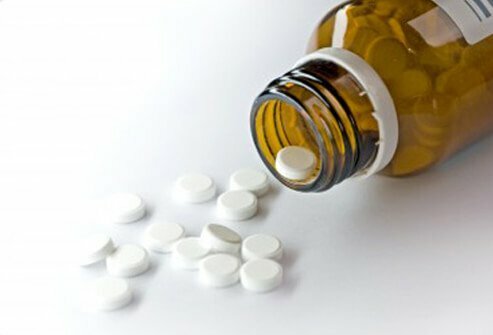 Should I Take Salt Tablets During Hot Weather? Do not take salt tablets to replace your electrolytes when you sweat excessively. They may be harmful or replace too much sodium, which may cause problems with your blood pressure, kidneys or heart. Plain water will help hydrate best. What Is the Best Clothing for Hot Weather or a Heat Wave? Sweating cools the body by evaporation which pulls heat away from your skin. If sweat is not allowed to evaporate due to tight clothing or certain non-breathable fabrics, this leaves you at risk to overheat or get a heat rash. Wear clothes made of fabrics such as cotton or synthetic fabrics designed to "wick" sweat away from skin to help it evaporate when you work out or expect to be exposed to heat. Medscape Reference - Courtesy of K.E. Greer, MD. Centers for Disease Control and Prevention (CDC): "Heat Stress." 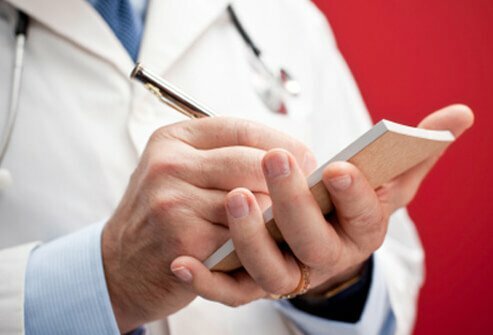 Family Doctor: "Heat Rash Overview." UpToDate: "Patient Information: Heat Rash (Prickly Heat) (The Basics)."